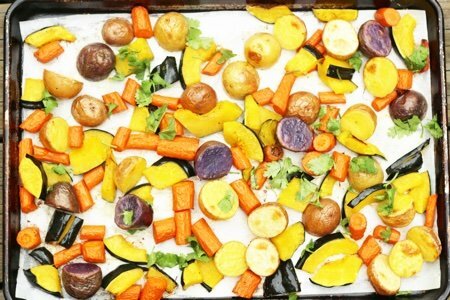 This roasted winter vegetables recipe is a gift for you for the entire winter season. Here in New England, we have a ton of local winter vegetables. Parsnips, carrots, potatoes, beets, butternut squash, acorn squash and sweet potatoes fill our farmer’s markets all winter long. I have written about roasting vegetables I believe every week for the past 2 years! Have you tried my roasted tomatoes with garlic or my balsamic roasted green beans? These vegetables on their own are pretty dull. I mean why do we call people couch potatoes? Not because they are filled with life. But, if you can get your hands on some of the purple variety – you have another animal all together. This is what they look like before they are roasted (still dull) but roasting makes them pop. The idea here was to create something that even my children could not resist. Look, kids – rainbow food! 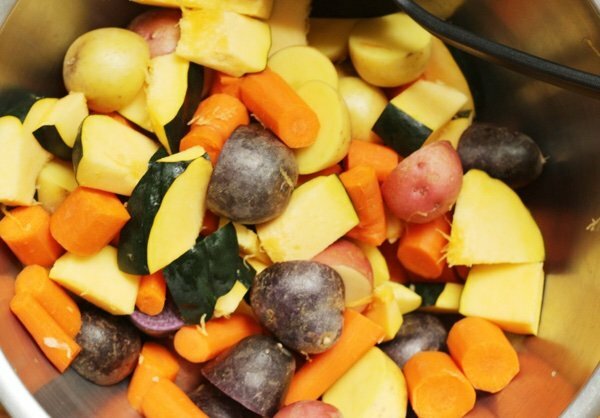 There are many colors in winter food. I know that summer gets all the attention with its tomatoes, strawberries, and eggplants – but you can create a stunning visual presentation with winter vegetables as well. Take these off the roasting pan, but them in a silver bowl and hand them around your Thanksgiving table. I am positive you will get “ooooh” and “aaaaah” as they make their trip around. Use whatever winter vegetables you can find as fall deepens and add thyme, rosemary, and or garlic to dress this dish up a bit. If you have beets, you have to peel them to make them work with the rest of the vegetables (same with butternut squash). The acorn squash is too much of a pain to peel. I try to pick a young one and I simply eat the skin. I put these veggies in my sandwiches, on top of salads or rice and I love the sweet flavor that is created by the roasting process. What are your favorite winter vegetables? Heat oven to 425 degrees and line a rimmed baking sheet with parchment paper. Slice carrots into 1 inch pieces. Slice acorn squash in half and spoon out the seeds and stringy bits. Slice acorn squash into 1 inch pieces (don’t worry about peeling it). 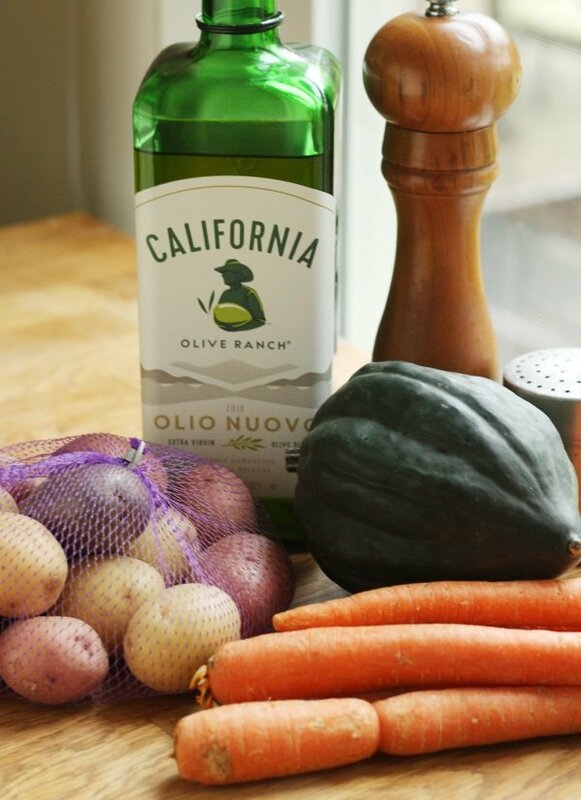 Place carrots, potatoes, and squash in a medium bowl and toss with olive oil and salt and pepper. Spread out on prepared baking sheet and roast for 35-40 minutes. Sprinkle with parsley or cilantro and serve. Can be made a few days ahead and reheated in oven or microwave. 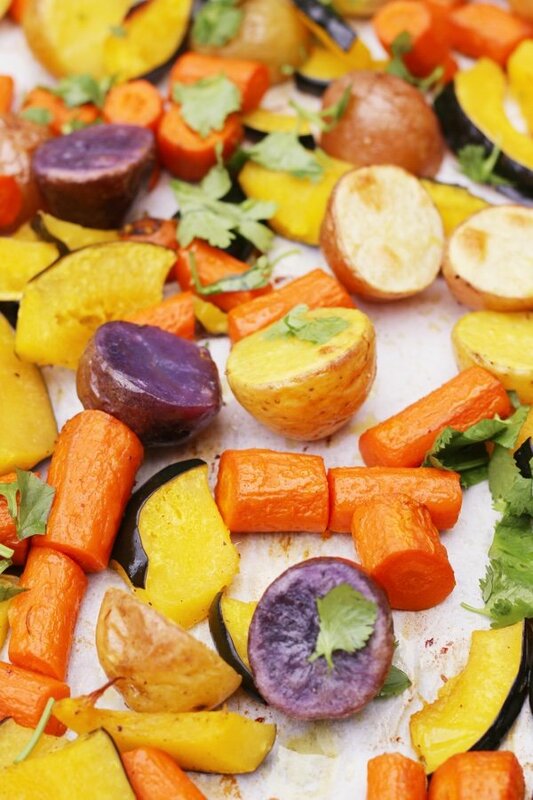 Yes, I love roasting veggies! Makes them so tasty. Acorn squash is so good roasted. I especially like roasted fennel added in. or chunks of onion. I never thought I liked fennel but try roasting if after cutting in thin slices. It's my fave now. Just trim off the root end. I make a whole dinner like this. Slice veggies and top with chicken thighs and legs. The chicken juices baste and add flavor to the veggies. And dinner is in one pan. Easy clean up if you use parchment or foil under it all too. They are called "sheet pan" dinners. Google that for more ideas. Great for fall and winter.